Potluck parties are a common feature in the Non-Resident Indian (hereafter, NRI) culture in America. The 'culture shock' and learning curve of such parties has even been brought out in NRI novels such as 'India Was One.' When many NRIs land in the USA, they want to get together, socialize, and most importantly eat. These parties happen in the various houses of the NRI community members on a rotating basis. These are not small parties- but can host anywhere between 8 and 20 or more families at once. Since sharing of labor can reduce the stress and pressure on the host, each family or guest brings a menu item to share that everyone in the party can eat (known as "a dish to pass"). Though discussions may happen about who will bring what dish (pot), many times it can be decided at the last minute (luck) based on available ingredients and other dishes not on the menu. We all like to mingle with people most like us. Potlucks allow the Desi circles to meet up on the weekends when life is not as busy to get together, talk, hang out and be comfortable around others in the same social circle. In small towns, these get togethers are more pan-Indian in nature having NRIs representing different parts of India. However, in bigger cities where there are significant populations of NRIs, these parties become very regional in nature – with focus on ethnic and linguistic groups from different parts of India (Tamil, Telugu, Marathi, Bengali, Punjabi, Gujarati, Kannada, Malayalee, etc.). Potlucks may happen at Hindu Temples during weekly pujas (prayers), in mosques (Muslims), gurudwaras (Sikhs) and churches where significant Indian populations frequent. Since every guest or family is ‘trying their hand’ at cooking dishes and sharing them, attendees of potlucks get to taste and learn recipes from different Indian traditions. Since all the food is homemade, a slight change of ingredients or methodology can change the final taste quite drastically. 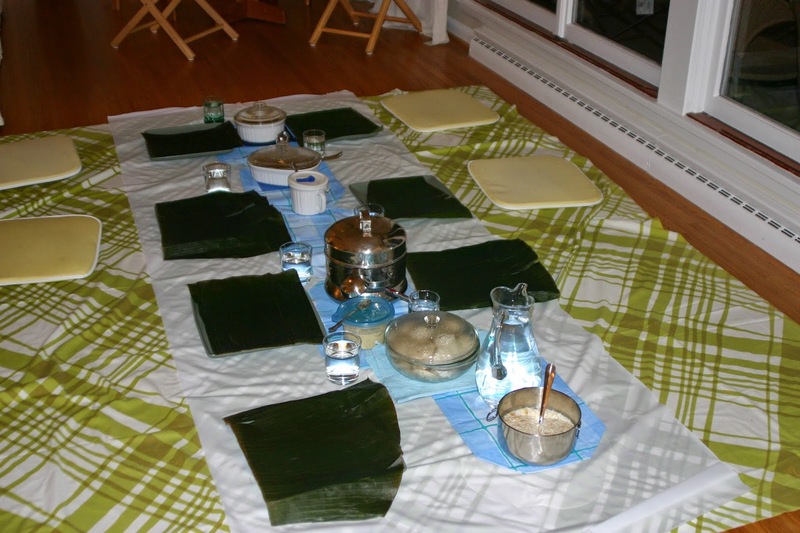 In potluck parties, one can learn about the culinary traditions of various regions of India. Although NRI potlucks generally are limited to regional or pan-Indian food, American food is also part of the menu. Potlucks attended by single professionals and married couples without children may restrict American menu options to snacks and baked goods. However, as the NRI families grow, and their children go to school, slowly American foods are added to the menu. Occasionally when a new American menu item is added to the NRI potluck table, it receives a lot of gossip and acclaim. Upon introducing hit recipes to the NRI group, regular group members will start to notice the scores of individual adaptations of a recipe as this menu item is made by different women and bought to the consequent parties. Limiting the importance of expat potlucks to three criteria is almost unfair. Over the years, reading expat blogs from Indians in the US and Westerners in various countries, I understand that potlucks are important for very similar reasons among various expats in different countries of the world. What are your experiences with expat potlucks and what are some important features of expat potlucks from your point of view? Please share your stories. If you know anyone moving to the US for education, career, or family, Jennifer Kumar helps foreigners and expats adjust to American culture from an insider perspective. Learn to speak more confidently with Americans and understand their ways through coaching. Contact Jennifer today. Chris Sufi is a freelance editor who lives in Bangalore, India. Her personal interest in language and communication inspires her to contribute through proofreading and editing. She can be contacted here.